If you are still suffering from sloppy guitar playing, the cause is likely unwanted string noise. For some guitar players, improving guitar technique may have nothing to do with how they are playing the notes they ‘want’ to hear. The sloppy noises we sometimes hear are caused from the notes (strings) we do ‘not’ want to hear. If you are articulating the notes you want to play accurately, but you are still hearing sloppiness in your playing then this article will greatly help you to improve your guitar technique by eliminating string noise. To effectively mute guitar strings we do not want to be heard we need to use two totally different sets of muting techniques: One to stop unwanted noise from LOWER (in pitch) strings; and another to mute the higher (in pitch) strings. Although there is more than 1 way to mute guitar strings, some methods offer advantages that others do not and are therefore (in my opinion at least) better. 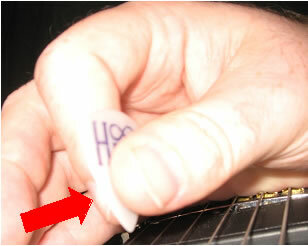 Many guitar players use the palm of their picking hand to mute lower strings. Although this technique is pretty good at keeping most of the lower strings quiet there are two big disadvantages with this technique. a. The flesh of your palm is much softer than the side of your thumb and therefore takes more time for your palm to actually stop the string from sounding. b. It is not easy to get your palm in the perfect position to consistently and reliably mute strings that are adjacent to the one you are playing in all playing situations. 2. When you use your palm to mute noise, the natural position of your guitar pick (when not playing) is now away from the strings. This is what I call your “Natural Point Of Rest”. When your pick is at rest up and away from the strings (in between playing each note), it causes your picking hand to work harder and significantly increases the chance for sloppy playing, string noise and slower picking speed. A great solution to these problems (and to improve your guitar technique) is to mute with your picking hand thumb for all lower (in pitch) strings like this. 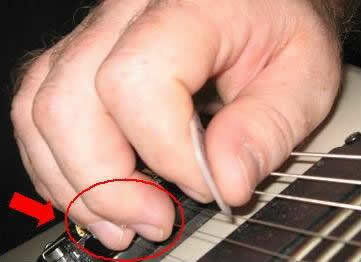 Notice that the “Natural Point Of Rest” when using thumb muting is now ON the strings (as shown in the picture above). This greatly reduces wasted motion and enables you to pick faster with much less effort. Many guitar players are totally unaware of the possibilities for muting string noise from the higher (thinner) strings and this part of their playing is often one of the causes of sloppy playing. There are actually two main techniques for muting noise from the higher strings that I teach to my students when training them to improve their guitar technique. 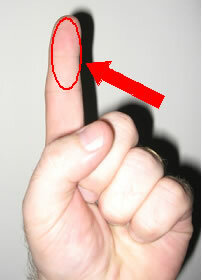 The first technique involves using the underside (the fingerprint side) of the fretting hand’s index finger. 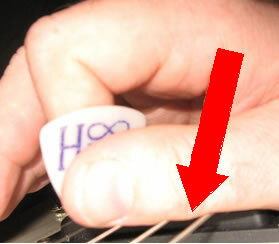 This part of your finger is used to “lightly touch” the higher strings that you want to mute. The key word in the last sentence is “lightly”. You do not want to press down so hard that these notes begin to sound like regular fretted notes. Simply rest your finger on them thus preventing them from sounding. In addition, you can also mute these higher strings by using the unused fingers of your picking hand (fingers that are not being used to hold the pick, such as middle, ring and pinkie). This extra layer of muting ensures that there is no possibility for the strings higher than the one you are playing to ring out and add sloppy string noise into your guitar playing. When these ideas are combined with the string muting techniques of muting the lower strings, your playing will instantly become much cleaner than before. Now, every time you play, the only guitar strings that will be making sound are the ones you are playing! To get more guitar playing help check out my 15 Free Guitar Tips.